Announcement It's time to get your outdoor spaces ready to enjoy! Check out our hardware kits that will turn your wine or liquor bottles into outdoor lighting that also keeps the bugs away. 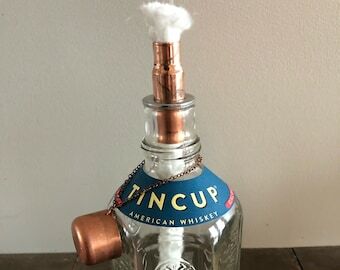 The Harvest Moon Shoppes sells hardware kits that allow you to upcycle your own wine or other glass bottle into an outdoor tiki torch or wall vase. Thank you for visiting! Be sure to like us on Facebook: http://www.facebook.com/HarvestMoonShoppes. It's time to get your outdoor spaces ready to enjoy! Check out our hardware kits that will turn your wine or liquor bottles into outdoor lighting that also keeps the bugs away. Shipped on time. Instructions would be nice. I can’t say enough about this seller and the item! He went over and above to make this a successful transaction. Unfortunately, there was a hick-up in my first order at the post office (that he had no part of ) but the seller immediately handled the issue. I realize it was probably a total loss for him and I want to acknowledge that and genuinely thank him for his outstanding customer service!! The torch kit is awesome and I can’t wait to show my lanterns off!! These are beautiful additions to any yard. This is great. Great service. I’m using it and creating a hanging bike rack with it. I’ll post a photo when I’m done. Fleamarkets, yardsales, and pickin have been a part of my life since Ican rememeber. My grandad used to take me to yardsales as a kid and would give me $10 and ask me to walk up to the cashier and ask them if they would take $10 for something that had $75 on it. He knew very well that no one would turn down a kid holding a $10 bill. Those "negotiation skills", if you can call it that, prepared us for where we are today, turning trash into treasure by upcycling. Welcome to The Harvest Moon Shoppes! 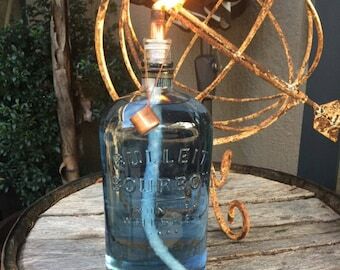 We sell hardware kits that allow you get creative and upcycle your own wine bottle into a unique outdoor tiki torch or wall vase to go with your decor. Also be sure to check out our upcycled soap dispensers. We hope you enjoy! If you are unhappy with your purchase, please convo us and we can discuss a refund or exchange (less the shipping fees). We accept paypal or direct check out as a form of payment. We appreciate all payment being placed within three days of purchase. We will send out your item within 3 business days of payment. All shipments are sent out via USPS unless otherwise requested. We will also provide a tracking number via email once shipped. If the addresses entered in Etsy and PayPal are different, your item will be shipped to the address provided in Etsy unless other direction is received.